A Macedonian banker started the Popova Kula vineyard after being inspired by California's Napa Valley. Demir Kapija, Macedonia -- Jordan Trajkov was a successful banker studying for an MBA when he visited Napa Valley in California. 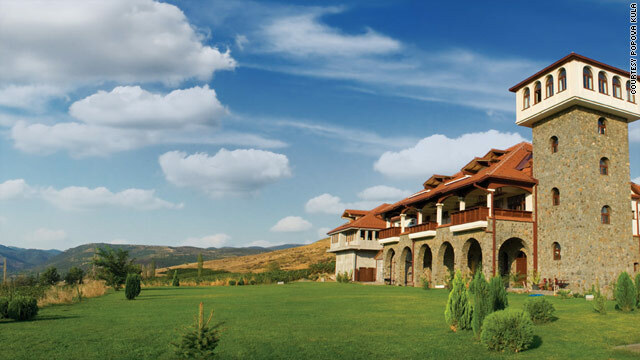 The visit inspired him to go back to his roots and start a winery in his native Macedonia. Trajkov's father had owned a vineyard, but when Macedonia was part of socialist Yugoslavia he was not allowed to produce his own wine. "There were just a few big wineries and my father had to sell his grapes to them." Trajkov told CNN. "But my grandfather had his own winery before socialism and that inspired me. "From an early age I had worked on my father's vineyard, but I had never had the opportunity to make my own wine." Trajkov, now 41, worked in banking for seven years in Macedonia, London and New York. He was studying for an MBA in Phoenix, Arizona, when he took the holiday in Napa Valley that was to change his career. Trajkov returned to Macedonia and in 2003 bought some land close to where he had grown up. He planted his first grapes in 2005 and began selling wine from his Popova Kula winery the following year. "Bringing together the concept of wine tourism with grape growing and wine making was fascinating for me," Trajkov told CNN. Popova Kula produces 23 varieties of wine, but Trajkov's favorites are those native to Macedonia. He is keen to give a future to the ancient vines denied when Macedonia was part of Yugoslavia. Then, production was all about bulk export of more common grapes, such as cabernets and sauvignons. Alongside his better-known grapes, Trajkov produces Vranec and Stanushina, and has won international medals for several of his wines. "I describe our philosophy as 'glocalization', promoting the local varieties globally. We are really traditionalists. We think that there are some wonderful domestic varieties." Trajkov put all his own money into the winery, and his father sold his own nearby vineyards to invest too. Trajkov's former career as a banker has helped, and he became the first Macedonian company to be floated on its stock exchange. "I knew how to do that because of my background. We have strong equity," he said. "I cannot say our sales are as we originally predicted in our business plan, but I can say we hope to get there because our sales are increasing year to year. That's because we have highest quality wine." To increase sales further, Trajkov knows he must work hard on promoting his wines more widely. He has even built a hotel to accommodate tourists, with each room themed on a wine. Alongside the hiking, bird-watching, fishing and skiing on offer locally, the Napa Valley influence becomes clear.